Need A New Pool Liner? Here Is How To Choose! We all know that when it’s time to open the pool for the swim season you will often find that your pool liner has failed over the winter. This means that there is a new pool liner in your near future! But how are you supposed to choose? With choices in color, pattern, texture, and thickness to keep in mind this choice can be a nightmare. But it doesn’t have to be. We have put together this resource to help you make the right choice for your new pool liner! This is your first step in narrowing down your choices. What do you want your overall color to be? When you know that you want a more beachy looking pool from the start, you will be able to skip right over the deep blue options. While the pool liner does play a factor in the color of your finished pool, it is important to keep other factors in mind that will come into play. Such as the sky. Your pool becomes a giant mirror and will reflect the sky and clouds on any given day. That is why you see that beautiful blue in the ocean instead of the sandy color of the beach. Another big factor is depth. The color of the steps of your pool will show the pattern of your pool liner as is but once you start adding depth, those details tend to disappear but the color deepens. The natural light around your pool will also have a play on the color of your pool. Just as the weather will alter the color as well. When the rain comes and the sky is dark, your pool will look much darker as well. Lastly, you must consider if your pool is in the full sunlight or if there is shade around it. If your pool is in a shaded area, you will want to choose a lighter/brighter color for your pool liner. The next step is to choose your pattern. The good news is you narrowed your choice with your color selection however, you still have a LOT of choices! Patterns can mimic natural stones, tiles, marble and even jewels. No matter what look you are going for, you can rest assured that we have something that will suit your needs! We suggest choosing a liner that compliments the surroundings of your pool. So take a look at any decking, patio design and any natural elements that are going to be around your pool. That said, we do have to let you know that this choice can enhance your poolscape or completely clash depending on this choice. The good news is that the possibilities are in fact, endless. We can help you find the exact liner you are looking for and will love for years to come! The first consideration when choosing your texture is, what is going to be covered? Do you have added features in your pool that is going to need to be covered in your pool as well? This will help you to determine the texture that you are going to want. The texture is invaluable when you are going to be covering your pool steps. You don’t want to take that first step in and then slide the rest of the way in! While there is normally an extra incurred charge for the texture, we assure you that it is a worthy expense when you consider the safety of your family while in the pool. However, do not fool yourself into thinking that you can let your pool chemistry slip. 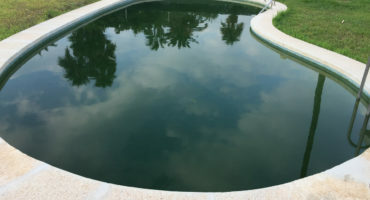 You will only damage your pool and ruin your swim season if you allow algae buildup because you did not keep your chemistry in check. Here is the crucial factor in your pool liners longevity. Thick pool liner or thin pool liner? You may be thinking that the thicker pool liner is the way to go because it will last longer and be less prone to tears. However, if you live in this cold climate and your liner is installed on a cold day, the liner is not going to be pliable and will become prone to rips and tears much quicker. With all of this in mind, we do have tricks that we use to keep the thicker liners warm for installation. We suggest that you find the pool liner that you love first and THEN choose your thickness. No matter what liner you choose, you must always be working on your pool maintenance. From keeping the chemistry balanced to inspecting all of the working parts, there is no replacement for responsible pool ownership! Replacing the pool liner is an eventual expense every pool owner is going to incur when you own a vinyl lined pool. We truly hope that you have found some helpful information on how to choose your next pool liner. Remember, you can always contact us with any and all questions and we are more than happy to help you find everything that you are looking for! Happy Swimming! US Air Water Products Heat Pump For Your Cool Climate Pool!